New, and ongoing, opportunities to apply for, including.. The African Media Initiative (AMI) African Story Challenge provides grants to support African business reporting and is inviting applications from individual journalists and newsrooms with unique story ideas or projects on business and technology that can only be produced with substantial support. The top twenty multimedia projects that show the best potential for adopting innovative storytelling techniques using data journalism tools, will be shortlisted for the final prize and will be awarded grants of up to $20,000 to produce them for broadcast and publication. The All Africa Business Leaders Awards [AABLA] awards invite nominees in four categories, business leader of the year, business woman of the year, entrepreneur of the year and the young business leader of the year who through their vision, leadership and commitment make significant contributions, financial impact and/or a considerable differences through their assistance given to the work of voluntary organisations, communities, causes or society. Deadline is 23 May. scholarships for candidates from developing African and South Asian Commonwealth countries to study for the part-time Masters degrees in International Human Rights Law from September 2014. Deadline is 23 April. Nominations are now open for the 2014 Kenya Banking Awards by Think Business and categories include best bank in East Africa, and awards for product innovation, mortgage finance, SME, product, agency banking, internet, mobile, customer satisfaction, asset finance, best recovery, fastest growing, CEO, lifetime achievement, among others. 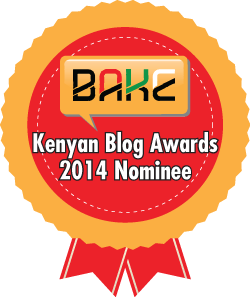 Vote for the short-listed Kenya Blog Award finalists for the year 2014. This blog is nominated under the best business blog and there are other categories for best blogs in technology, photography, creative writing, food, environmental / agricultural, fashion/beauty, politics, corporate blog, topical blog, sports, entertainment/lifestyle, travel, health, county blog, best new blog and Kenyan Blog of the Year. Kenya ICT Innovation Awards 2014 celebrate Kenyan companies and organizations that are using ICT in new and interesting ways. Categories this year include agriculture, BPO, education & training, environmental management, financial services, gender youth & vulnerable groups, healthcare delivery, housing & urbanization, manufacturing, social equity & poverty reduction, tourism, water & sanitation, wholesale & retail trade and finally county government issues. The deadline to apply is March 31. Pivot East The 2014 edition of the most prestigious East African mobile start-up competition is back, and yhis years conference will be held on 24th – 25th June in Nairobi, Kenya. Apply in 5 categories of mobile finance, mobile enterprise, mobile entertainment, mobile society and mobile utility by 11 April. The Rockefeller Foundation Bellagio residency program offers academics from universities or think tank-based academics or scientists a serene setting conducive to focused, goal-oriented work, and the unparalleled opportunity to establish new connections with fellow residents from a stimulating array of disciplines and geographies. Fiction and non-fiction writers should apply through a separate Arts & Literary Arts Residency competition, and the Foundation does have a limited travel assistance program, based on income level of invited residents. Deadline is May 1. The Royal Academy of Engineering Africa Prize for Engineering Innovation aims to reward entrepreneurship and innovation in Africa in disciplines from mechanical, civil and computing to biomedical, oil and gas, mining and electronic engineering. Every shortlisted entrant will receive six months of extensive mentoring, training and support in commercialising their innovation, as part of the Academy's commitment to international development. Thereafter, finalists will be invited to present their innovation and a winner will be selected to receive £25,000. The deadline for entries is 30 May. TED Fellowship. The TED Fellows program is looking for people who have "demonstrated remarkable accomplishment." Normally, there are two admission cycles per year: one for TED and one for TEDGlobal with 20 Fellowships to each conference. Deadline is April 18, 2014. Golden Baobab Prizes for Literature are an annual Pan-African award series that recognize and celebrate excellence in stories targeting African children. Deadline is June 29. The Business Daily Top40Under40 Women series is now open for 2014. Download entry forms from the Business Daily website and submit nominations via email.